Each day, truckloads of textiles and clothing are dumped onto our mountainous landfills. Despite most textile materials being fully recyclable, the crux of the problem is the sheer amount of cheap clothing being produced. Our exponential propagation of Veblen’s (1912) “Conspicuous Consumption” has meant that Western consumers buy 60% more clothing today than ten years ago (Dean, 2014, 9:12). 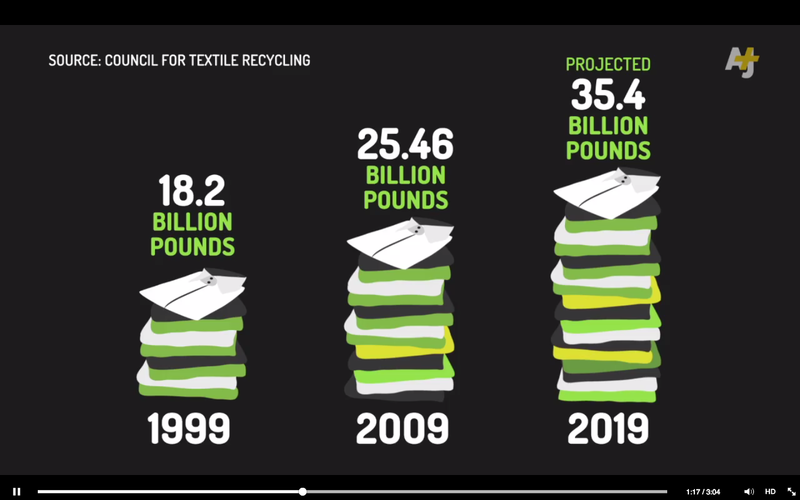 Furthermore, in the US over the past eleven years there has been a 1% decrease in overall landfill levels, yet the amount of textile waste has raised by 38% (Dean, 2014, 10:05). By 2019 there is projected to be 35.4 billion pounds of annual textile waste (Takruri, 2015). Why are we throwing out our clothes? Nowadays clothes are very cheap. A low price point generally equates to bad quality, prompting an absurd logic in modern consumers that ‘since this garment was cheap, I can throw it away after a few wears.’ We need to inform the average consumer about their wasteful and heedless choices. Redress is a Hong Kong-based organization that creatively raises awareness of textile wastage. They have an interdisciplinary approach and are funded by sponsors such as Miele and Elle Magazine (Redress, 2015). In 2011 they created a six-meter high art installation of second hand clothing. 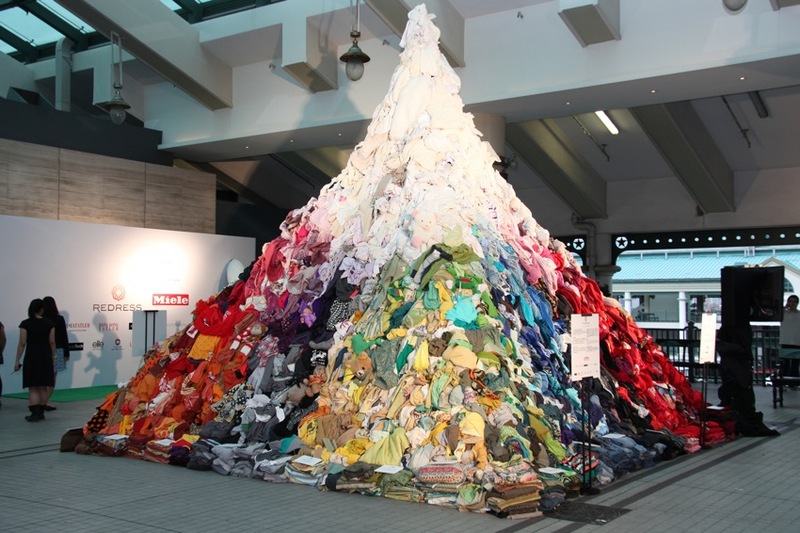 This mountain represented just 3% of the amount of clothing dumped in Hong Kong’s landfills each day (Redress, 2011). Hong Kong’s iconic Star Ferry was chosen to house the exhibition, metaphorically representing the transport, fuel and volatility associated with clothing wastage. This example of artistic design aimed to confront audience members with the unseen consequences of their everyday choices – that $4 top that you wore twice before tossing is now aimlessly sitting in a “mountain” of rubbish. Was it worth the $4? Christina Dean, founder of Redress, uses social media as a platform to spread social awareness of clothing waste. In her ‘365-day Challenge’ she sourced dumped, discarded or donated clothing and wore a different outfit each day for one year. She conjured this idea after witnessing one of Korea’s massive, hellish landfills. “I stood perched high on top of a man-made mountain of trash… I watched a queue of rubbish trucks locked in rush-hour-like traffic for their chance to dump into the tipping zone” (Dean, 2013, para 3). Dean posted daily photos on Instagram, Twitter and other popular websites. Within a few months, the story became a worldwide media craze with publishers such as The Guardian, Daily Mail and Yahoo hopping on board. She proved that online campaigns are also designed mechanisms to insight a shift in consumer consciousness. Post-consumer textile waste is a major environmental disaster. The modern consumer’s obsession with the cheap and the new is the root of the problem. Redress affectively use visual representations and captivating social media campaigns to connect individuals with the consequence of their waste, and hence to lessen waste at a pre-consumption level. This is a compelling strategy that “reunites Earthlings with the Earth” (Latour, 2013, p2). This article was a great read! thank you!